Louise Françoise Le Blanc de La Vallière is a young noblewoman attending the Academy of Magic in Tristain, a nation in a world far from Earth - a world with two moons. Like many in her caste, she hopes to be a great magic user. Unfortunately, though, she has earned the nickname "Louise the Zero", mostly because of her inability to cast the simplest of spells – which often turn into explosions. As with many second-years students, Louise is expected to summon a creature to serve as her familiar – but ends up pulling Saito Hiraga, a commoner boy from Japan, to her world! Now stranded and with no hope in returning to Earth, Saito is expected to do Louise's bidding, which includes cleaning her unmentionables and such - and to suffer harsh punishment from Louise if he fails or acts inappropriately. 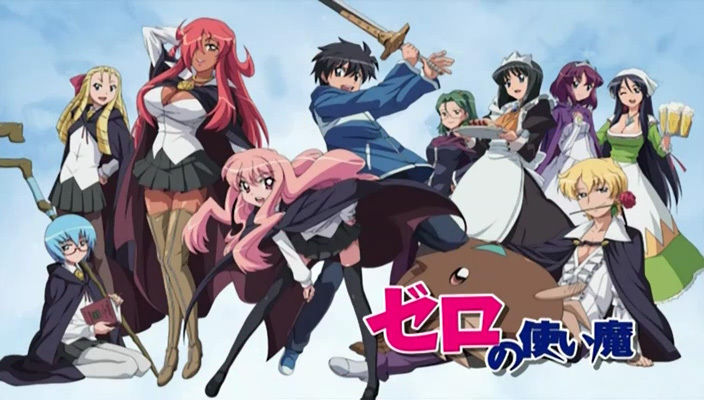 But in the long run, it may be Saito who is able to help his young mistress to achieve legendary powers only dreamed of – and soon, as a major crisis involving one of Tristain's neighbors comes crashing around Louise and her classmates!